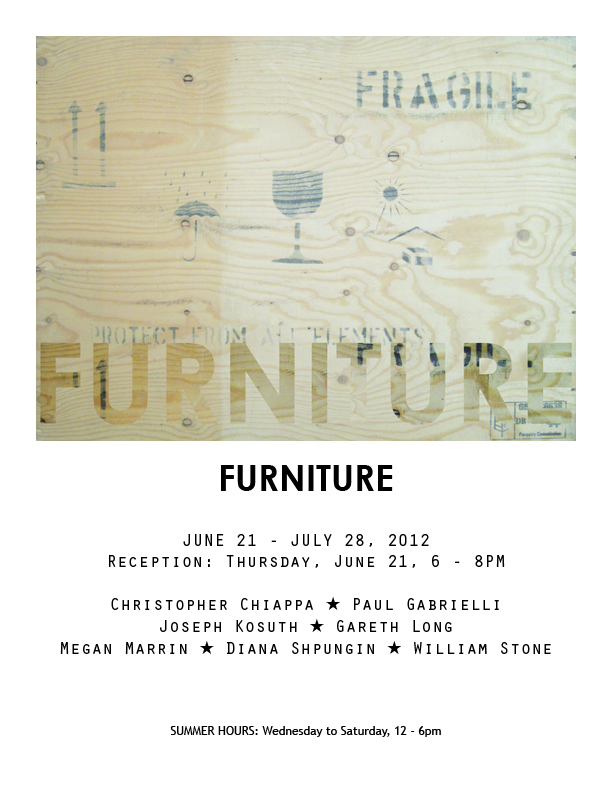 INVISIBLE-EXPORTS is pleased to present Furniture, a group show featuring work by Christopher Chiappa, Paul Gabrielli, Joseph Kosuth, Gareth Long, Megan Marrin, Diana Shpungin, and William Stone. Everydayness is not the enemy of inquiry and aesthetic revelation but its instigating setting. Together, the works collected here showcase a kind of sculptural gesture, extending to work in three dimensions the perspicacious lessons of genre painting—that all forms are ideal forms, and all objects, even, or perhaps especially, unexceptional ones, are inscribed through use and desire with personal and stupefying meaning. The result is a collection of familiar objects remade into meditations on personhood, perspective, consumer history, and private fetish—each work commemoratory and wondrous and bracingly approachable, a new kind of genre sculpture.